When I was invited to give a talk on behalf of ATLAS at this summer’s European Physical Society High Energy Physics conference (EPS), I wasn’t really sure what to expect. Most conferences I have been to are relatively intimate affairs where you have long discussions after every talk and then everybody trots down to the pub together to discuss the day’s results. 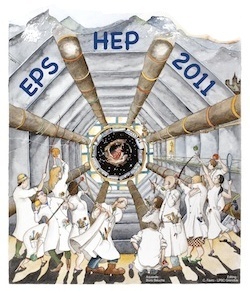 EPS, though, is one of the largest particle physics conferences in the world. Or at least I reckon it is, having eyeballed the number of participants registered on the website, hailing from all sorts of fields ranging from astrophysics to ultra relativistic ions to our very own LHC proton-proton collider physics. The stage may be huge, but one thing was clear however: one of the main focuses of the conference would be discussion of the latest results from new physics searches at ATLAS and CMS, most of which haven’t been not publicly presented until now. Of course there have been rumours (there always are) but so far the official findings of the big experiments have been kept under wraps. I arrived in Grenoble last Wednesday hot, sweaty and flustered with bike in tow, and after a long and confusing cycle ride all across town – most accommodation was booked out due to the Tour de France passing through the city during the conference – arrived at the large university campus grounds for the reception. There were lots of physicists eating all sorts of tasty French cheese and wine in the late afternoon sunshine and speculating on what results may be presented in the days ahead. The next day I woke up early in the student residences and rode my bike to the huge arena on the other side of town, where the conference was about to kick off. I received a bag of exciting freebies (USB stick, t-shirt and some still-to-be-identified objects that no-one has quite figured out the function of yet), and took a look at dozens of physics posters lining the walls of the main room. Eventually I joined everyone else in front of a screen displaying the days’ timetable - like an airport departure board – and started deliberating over which session to join first. In the days since then, some pretty intriguing results were presented. Kyle Cranmer is preparing a blog post with some of the details as we speak… So watch this space! Ellie Dobson is a CERN Post-doctoral Research Fellow based at CERN in Geneva. She works on the ATLAS detector’s Trigger system and is currently investigating multi-parton interactions in proton-proton collisions at the LHC.